occupied by the back nine of the Faon course. 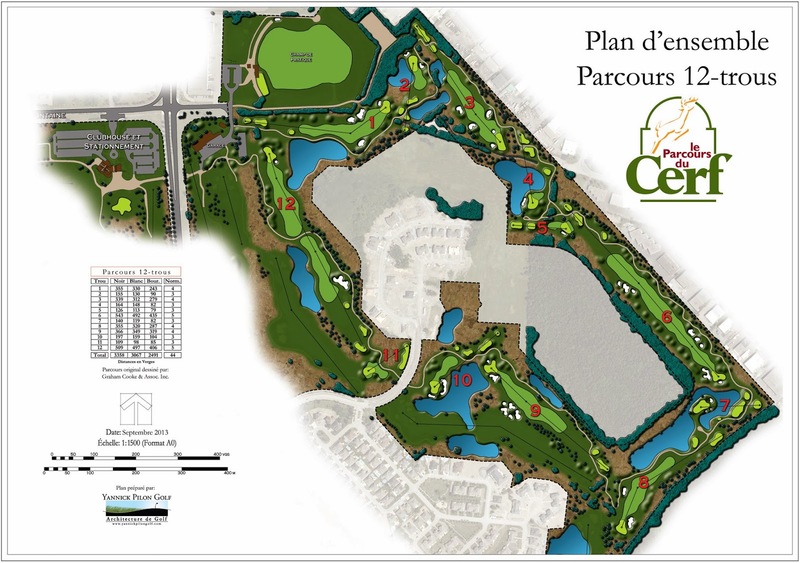 For the past year, I have had the privilege of working with the management team at the Parcours du Cerf, in Longueuil, in order to develop the first 12-holes regulation course in Quebec. This innovating project is now in the construction phase and the new course will be inaugurated in the spring of 2014. Personally, I believe it is an interesting idea that has merits on many fronts. A number of players complain that playing an 18-hole course often takes too much time in a time where young families are confronted with an increasing offer of leisure activities and busy schedules leaving them less time to enjoy activities like golf that require an important time and money investment. So it is with those two premises that the club had the idea of developing a 12-hole course. 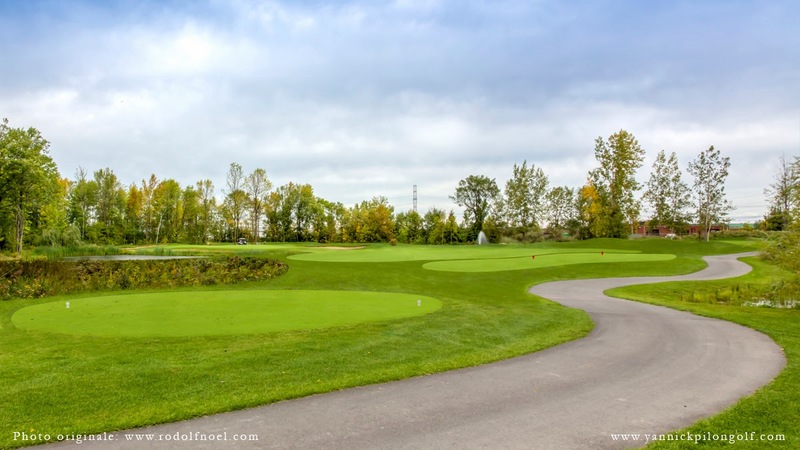 This course will offer a playing experience similar to the best courses in the province, but in a reduced format that will offer more than 9-holes to enjoy, but also less than 18. At a smaller price, and taking less time to play, this could prove to please a young crowd, as well as aging players and tournament organizers that will have the opportunity to play 12-holes fund raisers, as opposed to the 6 hours rounds most are accustomed with today! Curiously, the idea was mentioned by Jack Nicklaus a few years back, but it seems it has not been fully exploited since then. He even organized a 12-hole tournament at Muirfield Village Golf Club, one of the most prestigious clubs he designed. In it, cups of 8 inches were used instead of the regular 4.25 inches, and slow golfers were penalized! Those are a couple interesting ideas that are worth studying, the goal being of offering a fun, but quicker experience. How will the club offer a 12-hole course on its existing layout? The back nine of the Faon course will be slightly modified to make enough room for three new holes using some previously unoccupied land, and by modifying two existing holes. 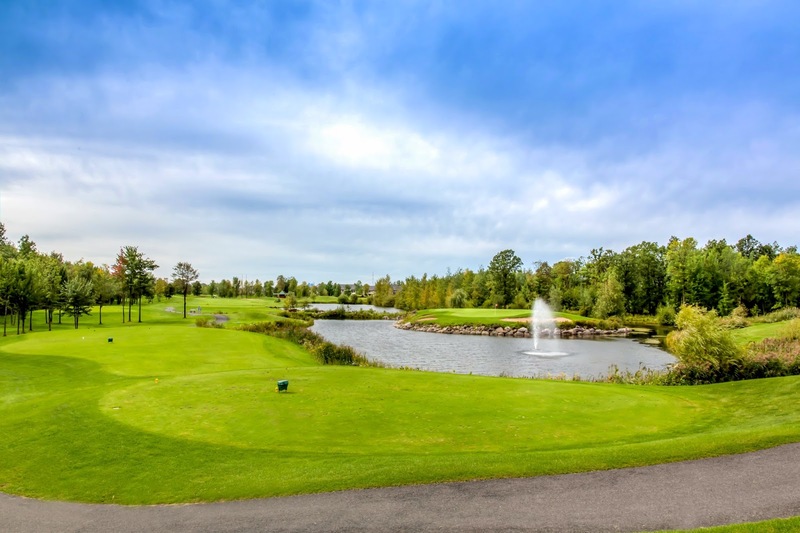 The front nine of the Faon course and the entirety of the Brocard course will be kept intact, offering golfers the choice to play 9, 12 or 18-hole rounds. Hole no. 10 of the Faon course will be divided into two holes : a short par 4 played towards a new green built in the middle of the existing fairway, and a par 3 using the existing 10th green beside a pond. Existing holes nos. 11, 12, 13, 14, 15, 16 and 17 will simply be integrated in the 12-hole course. 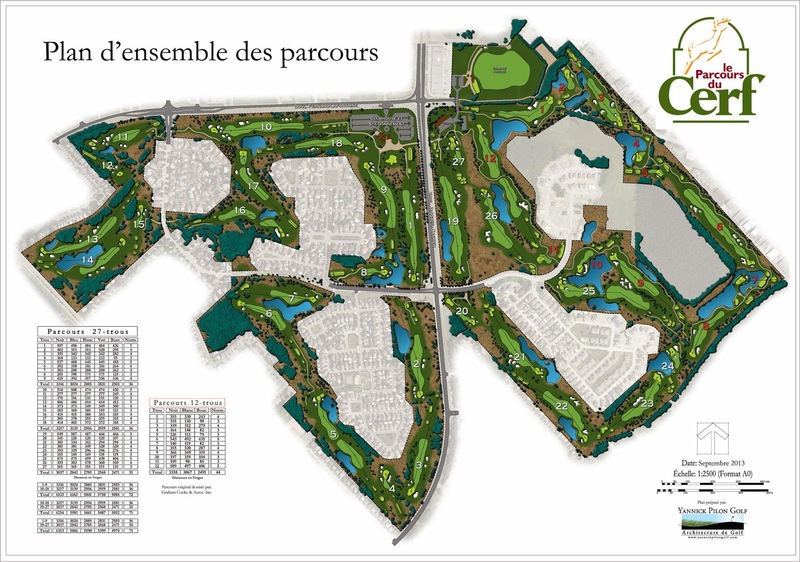 A new par three will be built behind the existing 12th green, and the existing 18th hole will be shorten to make room for a new short par three surrounded by mounding characteristic of the Parcours du Cerf landscape. Globally, this will offer a 12-hole course with two par 5’s of 543 and 509 yards, four par 4’s varying between 339 to 366 yards, and six par 3’s varying between 100 and 197 yards. for golfers who still want to play 9-hole or 18-hole rounds. Golf is often perceived as a conservative sport well rooted in long lasting traditions. Innovating ideas are few and far between and the level of participation in the sport has been stagnating over the past few years. Golf has to adapt and open itself up to a new clientèle, and even simply retain the one that has become elusive. I believe this can be done without being in contradiction with the origins of the sport. It is thus with great joy I have accepted to participate in this project, which, in my humble opinion, could become significant for the future of the game. · And a dynamic and innovative administration. I will be very interested in witnessing the golfers’ reaction to this new product next year. I believe initiatives such as this one are now necessary to insure the long-term viability of the sport. And I am quite happy to be part of this one.